køppe contemporary objects is a gallery & presentation platform for sculptural objects at the intersection of art and craft. Køppe Contemporary Objects has relocated to Bornholm. The beautiful island in the Baltic, with its longstanding craft tradition, was the first location in Europe to be awarded the title of ‘World Craft Region’ by the World Craft Council, in 2017. And for good reason. The island is teeming with activities. 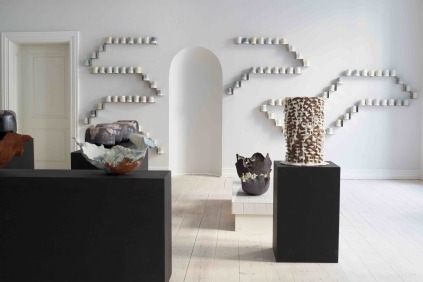 It is home to the Craft – Glass and Ceramics programme of the Royal Danish Academy of Fine Arts, School of Design, it has excellent exhibition venues, a world-class art museum and a vast number of glass and ceramics workshops that deliver tableware to the country’s gourmet restaurants. Going forward, Køppe Contemporary Objects will be presenting exhibitions on Bornholm during the summer season, while the gallery continues to stage exhibitions in Copenhagen and on art fairs around Europe during the winter season. Køppe Contemporary Objects at CHART DESIGN in Copenhagen 2018.